Looking for a fresh way to serve green beans? Polonaise refers to a dish garnished with breadcrumbs and hard-boiled eggs. Often, it is used to dress up vegetable dishes like broccoli and cauliflower. 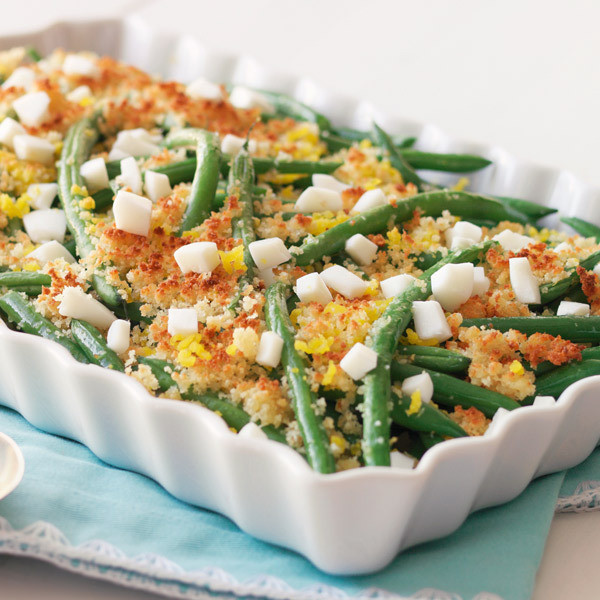 Here, the polonaise treatment transforms fresh green beans into a holiday-worthy side dish. Made with green beans, garlic, lemon zest and Parmesan cheese, this tasty twist on the traditional green bean casserole is sure to become a new family favorite. In large saucepan of boiling salted water, cook beans until tender, 4 to 5 minutes. Drain well. Meanwhile, peel eggs and halve. Separate egg whites and yolks. Press yolks through sieve and coarsely chop whites. In food processor, pulse garlic until finely chopped. Add bread, lemon zest and salt, and pulse until fine crumbs form. Add Parmesan and oil, and pulse until crumbs are evenly moistened. Place beans in broiler-proof pan in single layer. Scatter yolks over beans. Sprinkle breadcrumb mixture on top. Broil 1 to 2 minutes, until crumbs are crisp and lightly browned. Scatter chopped egg whites on top and serve.